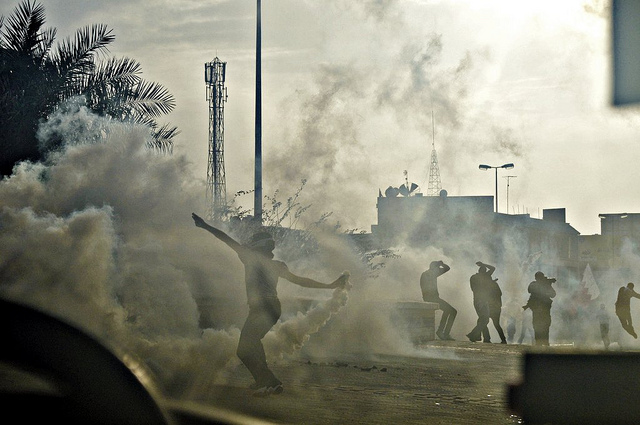 A cloud of tear gas disperses a peaceful march to the Pearl Roundabout in Manama, Bahrain, on February 13. Photo by Wafa A.S. Alnoimi. 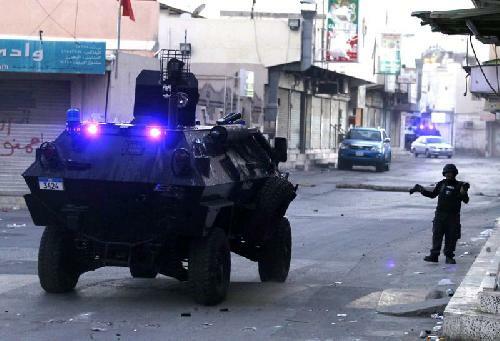 An armored car patrols the streets of Manama. Photo by the Bahrain Center for Human Rights. Brian Terrell is a Catholic Worker based in Maloy, Iowa and is a co-coordinator of Voices for Creative Nonviolence. Funny, i was catching a flight from bahraina and tear gas was right a the plane door! Thank you for the article and sharring the truth about Bahrain. Thank you for writing your experience of bahrain, I too was in bahrain during this week and what i witnessed will stay with me all my life! The horrific violence from the police towards these peaceful people is just too hard to put into words, as there are no words to describe the cruelty, the injustice which these people are suffering 24 hours a day 7 days a week. I too spoke to many people that have been tortured, jailed, beaten, sexually assaulted, stabbed. the list is endless. And what horrified me the most is my conversation with sheikh Abdulla Al Khalifa, his words really made me feel despair for the people, his denial of their feelings and their exsistence was truly unbelievable. There is a very serious problem in bahrain and the gov are trying to hide it, but i saw it with my own eyes, it is nothing short of Ethnic Cleansing, so i say to the world, Speak up as to be silent is a crime. thank you. First hand evidence is invaluable. I have tweeted with Sheikh Abdulla Al Khalifa. He told me he is serious about reform. However, there has been no reform; like the officials in MOI, MOE and in every gvt department, Sheikh Abdulla Al Khalifa lied. It is these liars who are advising Ecclestone on the F1 race, who are running a country without being elected, who are running the jails, the schools, the hospitals and the courts. Those who align themselves to these liars are motivated by greed and materialism, not by compassion or human rights. Linda, you have made a career out of harassing and trolling Bahraini officials but you are confused about this Sheikh Abdulla because he is not on twitter. In fact, he is one of my relatives and I know for a fact that the way you and Elaine Murtaugh have tried to disparage him is character assassination. The fact that you consider yourself the saviour of Bahrainis, but have never even been to my country and don’t realize there is more than one Sheikh Abdulla Al-Khalifa should be enough for anyone to discount your opinion. there will never be a serious reform as long as the royal family are taking over… they have to chose between their people or their relatives!